I tried to eat some leftovers from my sha cha chicken on salad from last week, but the salad had already wilted and was turning shades of brown and orange that I totally didn't trust. So I basically picked off the tomatoes, cucumbers, onions, and chicken (about 2 oz). Also had a Promax mini-bar because I was really hungry from the non-salad. My boyfriend had eaten lunch already, but he was having a sweet tooth attack, so he went over to the Dunkin Donuts inside our student center to browse while I was ordering my tuna melt. Next thing you know he comes over with a sheepish grin on his face and shows me his Dunkin Donuts baggie, with contained a buttermilk glaze stick and a berry berry donut. Apparently he bought the berry berry donut for me to try because everything I see it I mention how good it looks (plus it's a new flavor). Haha I think he also got it so that he wouldn't be the only one guilty of indulging in donuts. 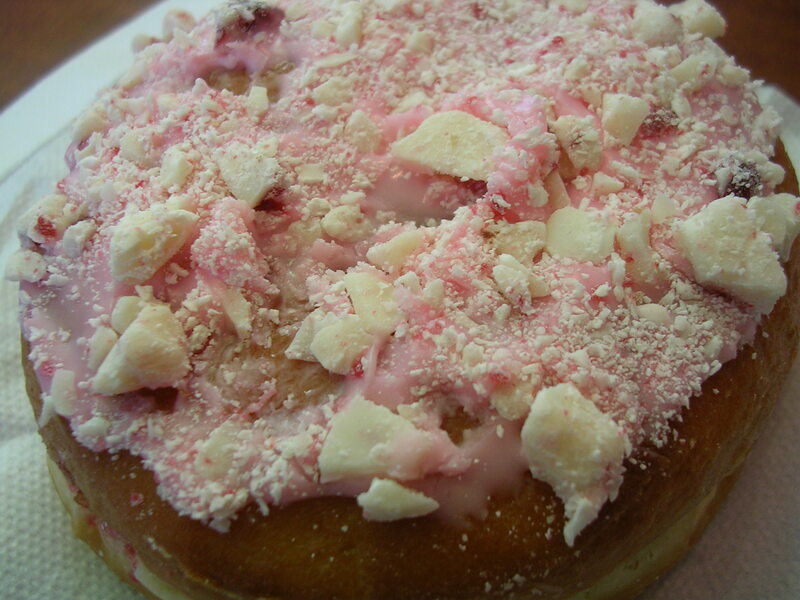 I ate 1/4 of the berry berry donut, which was a strawberry jelly-filled donut topped with strawberry frosting and chunks of white chocolate. It was really pretty, but also really sweet, and I dislike jelly filled donuts. But the topping looked so yummy it was almost worth it hehe. Rest of my tuna melt sandwich with half a bowl of turkey vegetable soup from Baker dining. 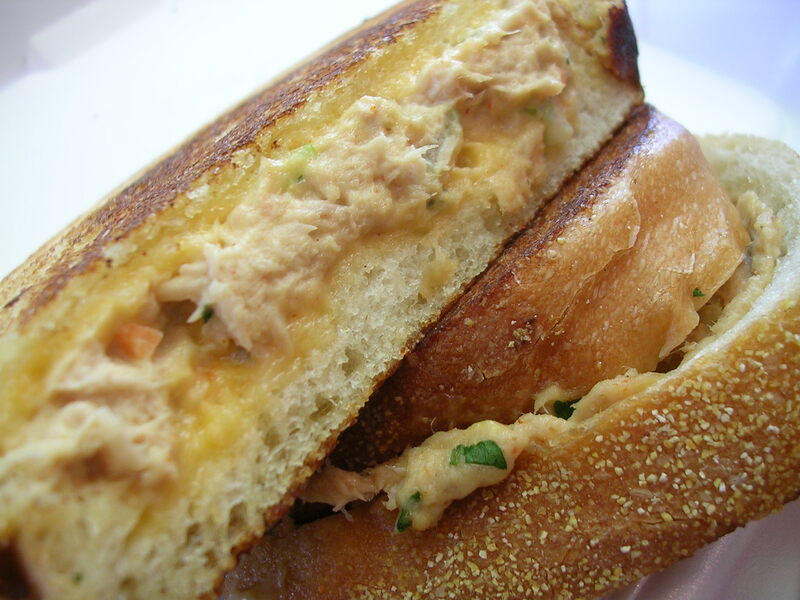 The soup was the perfect complement to the tuna melt, since the soup was brothy as opposed to creamy and not very salty either. 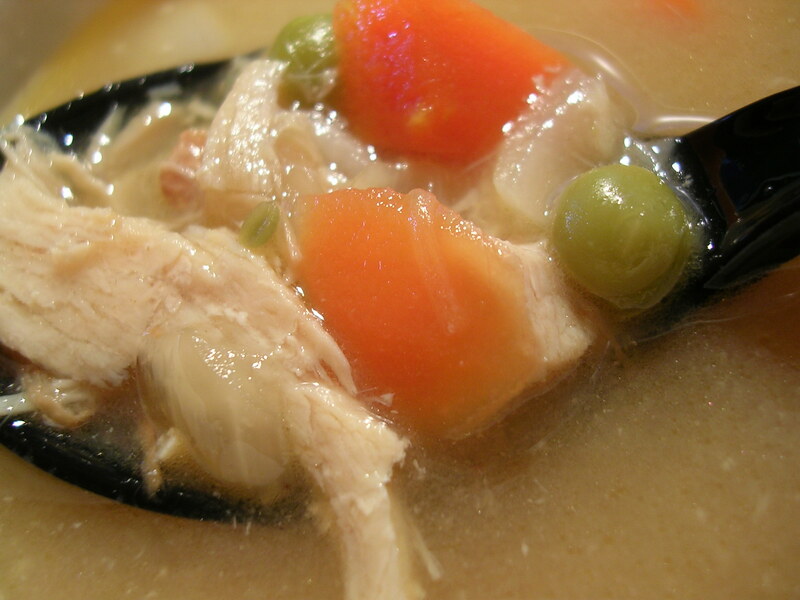 There were shredded pieces of roasted turkey in the soup, along with carrots, celery, peas, and a little bit of rice. I'm saving the rest of the soup for another meal. This entry was posted on Thursday, May 10th, 2007 at 3:55 am	and posted in American, poultry, seafood, snacks, soups, Uncategorized. You can follow any responses to this entry through the RSS 2.0 feed.